This is Sony Ericsson Philippine's way of delighting the Cebuanos, Sony Ericsson 12 days of Christmas is an exclusive promo to Cebu for the next 12 days leading to Christmas Day, Sony Ericsson will be giving away to 12 lucky winners, 12 months worth of iconic Cebuano products to anyone who buys a Sony Ericsson mobile phone anywhere in Cebu from December 12 until the 23rd. Wanting lechon every month for the next 12 months? Or getting your salon fix every month from January until December? Or, coffee breaks in the city's proudest and uniquely Cebuano coffee shop? To join Sony Ericsson 12 days of Christmas Promo, see details below. One gift certificate is worth Php1,000.00 for a total of Php 12,000.00 worth of GCS. Twelve winners will be drawn on the draw date. The customer will have to completely fill out the required information of his/her raffle ticket with his/her complete name, address, contact number/s, and affixed signature, email address and phone IMEI number. Winner shall be drawn on the above draw dates in the presence of a DTI representative at Sony Ericsson Shop, Ayala Center Cebu- 3rd Level, Ayala Center Mall, Cebu City. The winners will be notified through voice call and registered mail. Each of the winners is required to claim his/her prize within 60 days from receipt of registered mail. Failure to do so may result to the forfeiture of the prize in favor of the sponsor upon the approval of DTI. Winner will be required to present the phone purchased, registered mail, proof of purchase and any valid ID when claiming their prize at Sony Ericsson Shop, Ayala Center Cebu- 3rd Level, Ayala Center Mall, Cebu City. Representative from JYGonzales Strategic Communications, Inc and Sony Ericsson will facilitate the awarding to validate documents of the winning customer such as the phone purchased, registered mail, proof of purchase and any valid ID, Sony Ericsson will verify all information provided by the participant. False information automatically disqualifies the entry. Winners of the gift certificates can only use one GC per month January 2012 to December 2012. Sony Ericsson is not responsible for any complaints about the quality of products or services of the participating brands. 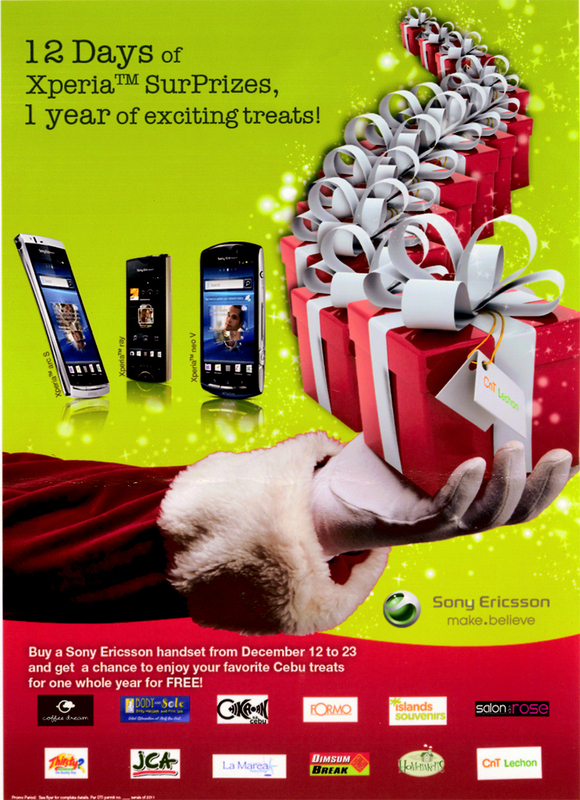 0 comments: on "Sony Ericsson 12 Days of Christmas Raffle Promo for Cebuanos"